Virginia Carraway Stark about life, British Columbia, screenwriting- and of course the many fantastic projects she spearheads at StarkLight Press. 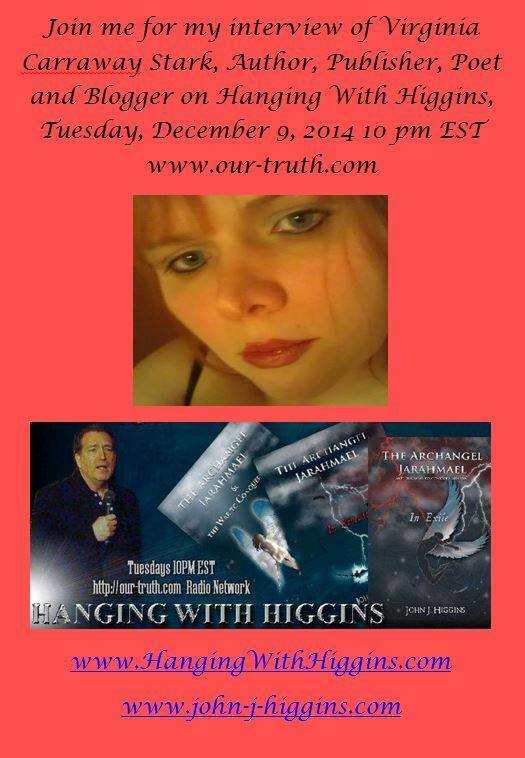 John J. Higgins is author of a fascinating set of novels involving angels, suspense and the supernatural. I thoroughly encourage all our fans to check out his work, and his set of remarkable radio interviews! This entry was posted in Author Interviews, Events, Our Writers, Uncategorized and tagged #Dalton'sDaughter, Aurora Award Winner, author, book, Canadian author, Canadian fiction, Canadian short story, celebrity interview, Dalton's Daughter, good and evil, hangingwithhiggins, interview, John J. Higgins, New Jersey, novel, our-truth.com Radio Network, radio, Science Fiction, StarkLight Press, The Archangel Jarahmael, Tony Stark, Virginia Carraway, Virginia Carraway Stark, Virginia Stark. Bookmark the permalink. ← Rolla Writers Association Convenes This Thursday! Reblogged this on I Have Memory.